Firms from the Swindon area that support fair and ethical business practices are being urged to enter a unique business awards scheme. Now in their fourth year, the highly successful South West Fairtrade Business Awards champion firms that put ethical responsibilities at the heart of their business. Last year 76 businesses from across the region achieved bronze, silver and gold awards in recognition of their commitment to using and promoting Fairtrade. Past winners have ranged from shops, cafes and hotels to independent financial advisers and universities. The South West Fairtrade Business 2016 awards are free to enter and businesses that meet the criteria will receive an e-logo, certificate and seats at the awards ceremony on March 11 at the At-Bristol Science Centre. Winners of each category receive a unique trophy designed by Bristol Blue Glass. There are seven categories: Best Fairtrade Office, Best Fairtrade Retailer –single product, Best Fairtrade Retailer – multiple products, Best Fairtrade Café or Restaurant, Best Fairtrade Accommodation or Conference Centre, sponsored by Sawdays, Best Fairtrade University or College, and Best Fairtrade Advocate Award, sponsored by SWTUC. 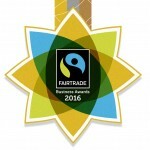 The best Fairtrade Business 2016 is selected from the winners of these categories. This award has been won for two years running by Koolskools, the ethical school clothing and Fairtrade cotton uniforms firm. Other winners were Lee Abbey (Best Fairtrade Accommodation or Conference Centre), Café Create (Best Fairtrade Café or Restaurant), Bristol law firm Lyons Davidson (Best Fairtrade Office), The Tiny Marmalade Company (Best Fairtrade Retailer – single product), Kerala Crafts and The Better Food Company (joint winners Best Fairtrade Retailer – multiple product), University of Bristol (Best Fairtrade University of College) and Elaine Ashley, Bristol City Council (Best Fairtrade Advocate Award). Next year’s awards ceremony will be hosted by ethical beauty and wellbeing guru Liz Earle MBE, pictured, who recently launched a range of Fairtrade Gold jewellery in association with Cred Jewellery. The Fairtrade Brunch and business-to-business networking at the ceremony will be sponsored by Shared Interest Foundation. Swindon Business News’ sister title Bristol Business News will again be media partner of these prestigious awards. Fairtrade guarantees a fair and living wage for small scale farmers in developing countries, as well as a social premium to benefit the wider community, to be spent on healthcare, education, clean water and more. Fairtrade standards also guarantee environmental protection of local ecosystems and rainforests, as well as strict controls on waste, carbon emissions and water use. Fairtrade is an excellent anti-poverty tool as well as supporting sustainable farming methods across the globe.